When I searched the Internet last summer for a San Miguel apartment, I only had five requirements–reasonable price, quiet, accepts Phoebe the Cat, no more than a fifteen minute walk into town, and a wood-burning fireplace. I soon found one which had everything on my list (well ok, not the inexpensive rent part.) God bless the Internet. Some landlords in my search told me via email that it´s not P.C. to burn wood here because there is so little of it and so their fireplaces are gas or they don’t have them at all, only electric heaters. But I rationalize that a few logs from dead trees burned to help me keep my sanity is less damaging to the S.M. environment than a big American car driving around El Centro and I had left mine in L.A. Or a gringa run amok! 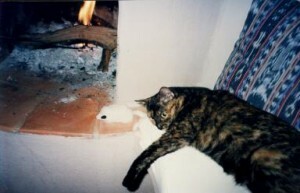 A fireplace is important because I live alone (except for Phoebe) and I know from past experience that a real fire is a living presence and company on lonely nights. I stare into it, adjust the logs, watch the color of the flames, smell the soul of the burning wood. Gas logs just don´t cut it for emotional warmth. So I reserved the apartment for the winter, and enjoy the occasional log fire those nights when I read or study Spanish. But in the middle of January the cold snap hit, with two days of icy rain. Hey, I´m from L.A., I know what it´s like to be cold in the house during the winter. But one small fireplace to heat a whole apartment on several levels when the temperature is below 35? Sure, I know people have lived here for thousands of years without heat, but they perhaps became acclimatized. After only a couple of weeks in Mexico, I wasn´t. When I asked my landlady for a small electric heater to use in the bedroom and the bath, she refused on the basis of the electric bill, and had the gardener bring in more wood, lots more. At the same time, the gas ran out and I had no hot water or cooking facilities. So now as I write this I am sitting (with Phoebe on my lap, she who never saw fire until we moved here), my feet on the hearth, and am enjoying the flames and embers for more than aesthetic and emotional reasons. More in touch with the reality of what is primarily important. I need the fire to warm my cold body–as well as my soul. And another of my requirements, the one about the 15 minute walk to town? I got that too, but didn’t know it is 15 minutes straight up! Which now is OK, too, because my body is in better shape and I can eat all those enchiladas and guacamole with impunity! And the hike keeps me warm.